The Illusionist has some lovely moments, but a one-note tone. 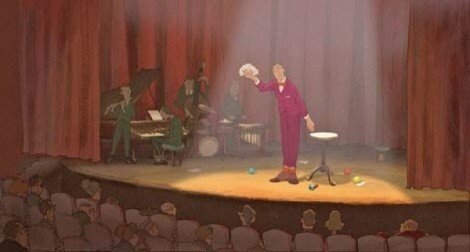 In Sylvain Chomet’s The Illusionist, an adaptation of an unproduced script by legendary French comic filmmaker Jacques Tati, nods to its creative inspiration are everywhere: in the main character’s design to resemble Tati; in the character’s name, Tatischeff, Tati’s own birth name; in the reliance on pantomime over dialogue; in a theater marquee showing the Tati classic Mon Oncle. There’s really only one place, in fact, that Tati is too little evident—in the tone of the movie itself. Set in 1959, the story follows the struggling stage magician Tatischeff as he tries to find work in music halls from Paris to the British Isles. In one coastal town, he encounters a young woman working as a maid in the pub—and when he befriends her paternally, she joins him in traveling to his next job in Edinburgh. That relationship—based, according to many reports, on Tati’s guilt over abandoning his first-born daughter—forms the backbone of what is otherwise a largely episodic narrative. The gorgeously stylized animation by Chomet (The Triplets of Belleville) has some lovely moments, including a shot from behind a boat heading to shore in which droplets of water appear on the camera. Mood is the master in this largely wordless tale, and Chomet unquestionably knows how to convey it. That mood, however, can be defined mostly as “melancholy”—which doesn’t feel particularly Tati-esque. A couple of sequences easily could have come from a Monsieur Hulot adventure, including Tatischeff’s amusing struggle with his job moonlighting at a car-repair garage. But sadness permeates The Illusionist, from Tatischeff’s own financial struggles to the bleaker responses of other performers to their changes in fortune, and through to the mournful finale. As beautifully as this story is rendered, the single note of its tone does affect the experience of watching it and wondering what happened to the comedian in Tati.